Commander Jim Martin (2nd from Left) of Addison VFW Post 7446 in Addison., IL, presents contribution to FOFH-IL President Betty Stamatis (Left) to help sustain Hines VA Fisher House humanitarian support of military families facing medical crises. On hand are Addison Village Mayor Rich Veenstra, (2nd from Right) and Harry Theodore, FOFH-IL Vice-President and Addison Trustee (Right). 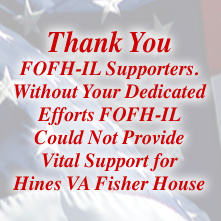 Continuing donations like this one from VFW posts, American Legion Posts and AMVETS are vital to ensure FOFH-IL can serve as sustaining non-profit support for this humanitarian program that has served 3,600 military families to date.